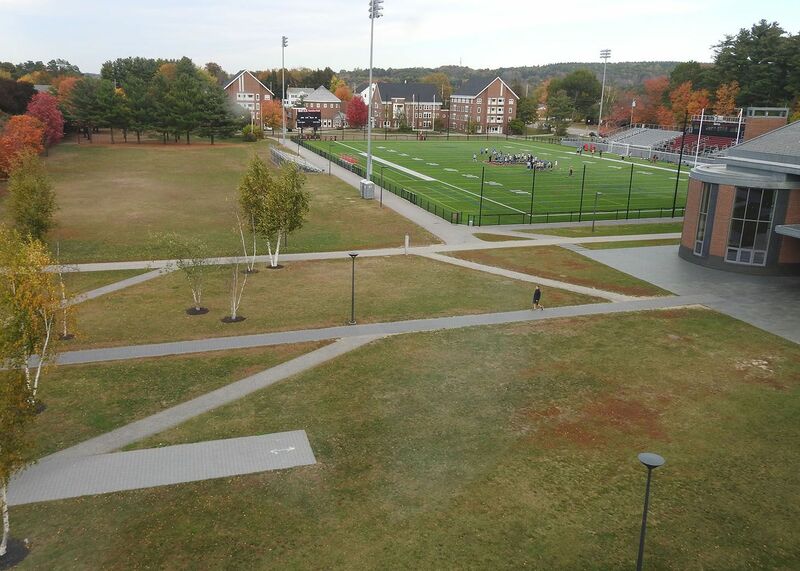 These two images of Garcelon Field, one pre-World War II and one from October, were both taken from the top floor of Roger Williams Hall. Both show the football team practicing. In the older photo, the team uses a practice field to avoid tearing up game-field sod. Today, since the addition of FieldTurf during 2010 renovations, the Bates varsity teams that use the field (football and lacrosse) play and practice on their game field. You can tell the historical image is from the 1930s because Garcelon Field still had its covered wooden grandstand, much like the grandstand at a county fair race track, complete with lockers below and seating for 600. The outmoded and unbeloved structure burned in 1939. It was no big deal, reported The Bates Student, since new bleachers were already planned. “Students turned out en masse to cheer while the structure gradually crumbled to the ground. The grandstands that replaced it were taken down in 2010 to make way for the current stands. Back then, a cinder track encircled the football field, and Garcelon was the site of track meets through the mid-1970s, when Bates stopped hosting outdoor meets until the creation of the Russell Street track and field in 2002. In the old photo, the baseball field (left) hadn’t yet moved across Central Avenue, which it did in 1986, its place taken by the Residential Village (center of 2017 photo) in 1992. At right in the new photo, you see the fireplace lounge of Commons. 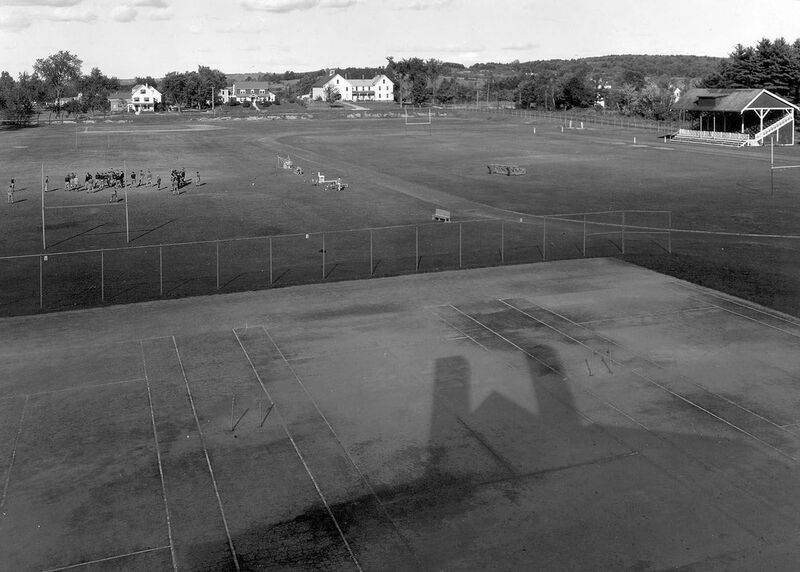 The tennis courts, seen in the foreground of the old photo, began disappearing in 1978 when new courts opened along Bardwell Street. The last courts, outside Alumni Gym, were made redundant in the mid-2000s after the opening of the Wallach Tennis Center in 2000. In the old photo, you can see the white farmhouse across Russell Street (right) and just the gable of the barn in the current photo. It used to house the art department; it’s now part of the Information and Library Services operation.